Allows use of legacy Microsoft Sidewinder joysticks with gameport connectors on newer computers with only USB ports, or versions of Windows later than XP. If you don't plan to use rudder pedals or other accessories, ignore the optional section with trim pots. 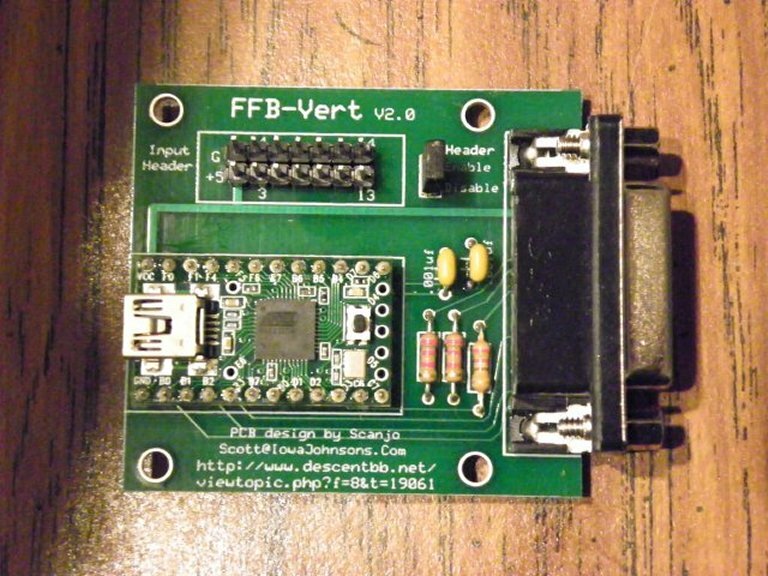 This project is a merging of the original 3DP-Vert project by Grendel which reverse engineered the Microsoft Sidewinder gameport joysticks, and Adapt-FFB-Joy by Cal (TLoimu) which built on 3DP-Vert project and added the force feedback effects, and the FFB Wheel project by Skoo which started from the Adapt-FFB-Joy project code and has the wheel working with no FFB. The wheel project is ongoing and we hope to have FFB on it as well in the near future. My goal was to build one board which would support all the different devices instead of needing to build different boards for each project. I also wanted to help people who either couldn't solder their own or just didn't want to. At this point you still need to load different firmware for the joystick you choose to use but even that may be changing soon. Cal has some ideas rolling around in his head but has to figure out if he can make them work. There are several technical hurdles to overcome such as memory space and hardware limitations of the board itself. More news to come. If you would like to build one of these adapters yourself, here's a parts list. For the resistors and capacitors, the voltage rating must be greater than 5VDC since that is the level of power supplied by the USB port. Other than that the voltage rating is not critical. Higher voltage resistors will get larger so keep it reasonable. Links provided for examples. Try to source your parts locally to save shipping costs. If you're in the USA you can expect about $48.00 for this list shipped. Other countries will vary based on availability. 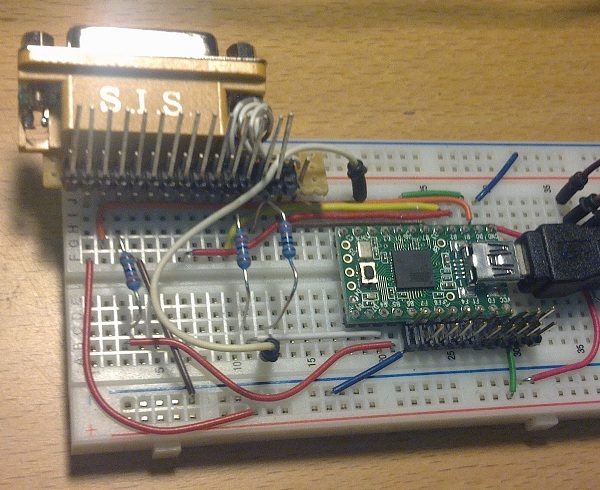 Click here to see an example of the breadboard project. 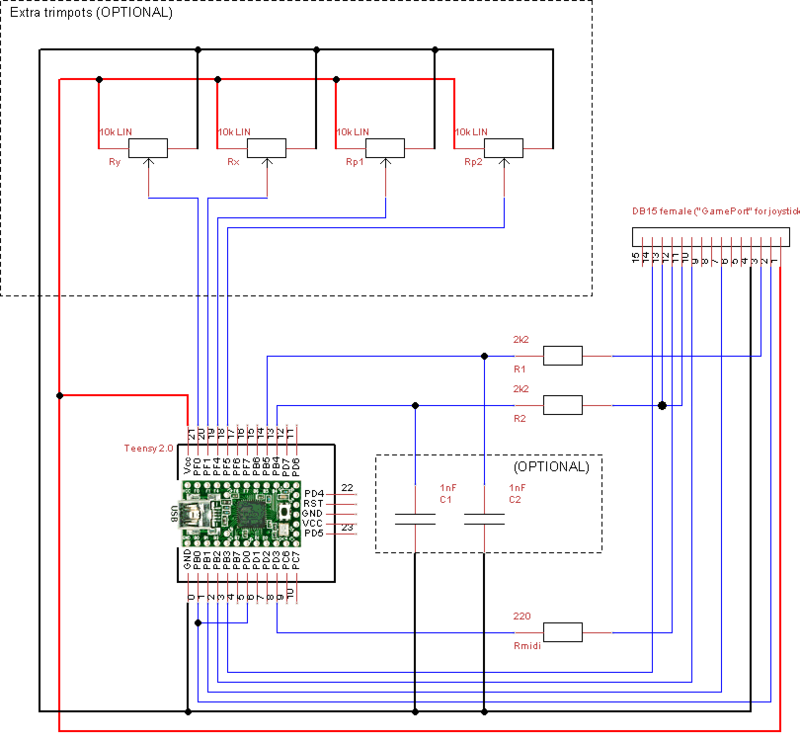 This is a slightly different schematic so don't copy it! This picture is just to show an example of layout. Capacitors are not shown, but they would go from the bottom end of the 2 2.2k resistors to the ground rail on the bottom of the breadboard. It also does not show the jumper from pin 11 to 13 on the gameport. If you would like to order one of these adapters, I am currently building and selling them. Sign up to BUY AN ADAPTER here. You can buy it in kit form, which includes everything you need to solder your own adapter together (pictured above), for $45.00. Assembled boards, which are plug-n-play, are $50.00. If Linux is your OS, you may need to install joystick support. I charge actual shipping charges that I pay so domestic orders are $7.90 for priority flat rate small box with up to $50.00 insurance and tracking. International orders were normally between $6.00 & 9.00 for one adapter (depending on weight & destination) but prices have gone up. I'm not sure what current prices are yet. There is no insurance on international orders since it would mean upgrading to priority international. The rate balloons to around $30.00 to $40.00 depending on weight and value. I've sold about 150 of these and have not had any damage reported to me and only one package lost (eventually found again and reshipped). If you insist on having insurance then let me know. If you want to pay the rate then I'll sure do it for you. Custom 3D printed cases are available now for version 2.0 boards only. Version 1.0 boards will NOT fit. You can see pictures and color options for 3D PRINTED CASES here. Michael (my case partner) has added these cases to his own 3D printing site. If you already have a version 2.0 adapter and would like a case for it, you can order directly from him. He is shipping domestic and international and has an online ordering system set up to order and pay through PayPal. He charges $12.00 for one color and $14.00 for a 2 color case with Descent logo. I charge you exactly what he charges me to print them. You save some money on shipping if you order your case and adapter together from me since Michael sends to me in batches of 6 or more and I split that cost across all the cases in the order. If you order from him, you'll pay the full price of the shipping for just your case. It saves customers around $5.00 by ordering the case with the adapter. If you have placed an order for an adapter, you can go to THE ORDER STATUS PAGE to see how things are progressing. Parts have arrived for run #3 and I am just adding everyone to the current page, including new orders as they come in. I'm building a little slower now as the weather gets better. As I have always said... work, family, and outdoor activities come first so I have less time for this project during the warmer months. I should be able to get to everyone fairly soon. Have questions? Visit the FAQ page. I discuss compatibilities, problems you may experience, and what to do to resolve them.